In today’s guide, we explain how to easily clean your AC filters to keep your air cooling system running efficiently. When the hot weather hits, one of the best ways to stay cool and collected is with a great air conditioner. AC units have two components: one is indoors – the evaporation section and one is outdoors – the condensing section. Air conditioning works by drawing hot air in and cooling it, before expelling it back into the room through the evaporation system. The unwanted heat is then sent outside, with the use of the condensing system. Air conditioners are a lifesaver – as long as they’re working effectively. If you’ve noticed a drop in the performance of your AC unit, or there’s a strange smell whenever you turn it on, it’s highly likely that it needs a clean. If you’re asking the question ‘how to clean window air conditioner filters’, or any other type of AC filter, you’ve come to the right place. But first, the filter is one of the main elements in your air conditioner that needs regular attention, so just what does an air conditioner filter do? The filter inside your air conditioning unit is essential for it to work properly. The filter is used to catch excess debris and make sure the air that is sent through the unit is not only cold but also clean. Your air con filter is structured with several fins all lined up next to one another and are pressed up against the coils through which the coolant is passed. If the coils are exposed to too much dust and debris, they can stop working entirely and the entire unit may need to be replaced – the filter is used to protect against this happening to excess. Recommended Reading: Don’t miss our guide to small air conditioners! Your AC filter performs a vital job for preserving the life of your unit and protecting the integral coils from damage and decay. If the filter has a heavy buildup of dust, the unit won’t work properly, the coils will not provide effective cooling and the quality of the air that you’ll receive into your room will be affected. 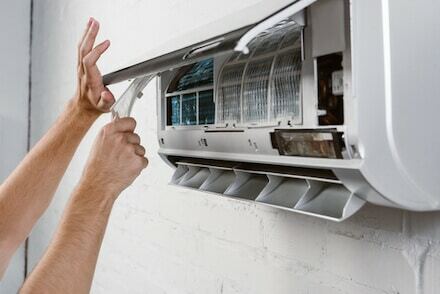 In order to get the most out of your AC system, it’s important you know how to clean air conditioner filter systems. It’s a straightforward and quick process and you’re sure to notice the positive effects as soon as your unit is up and running again. Read on to find out the most effective ways to give your air conditioner filter a good clean. We hope this article has helped to enlighten you on how to clean an air conditioner filter. If you clean your filter on a regular basis – every couple of months ideally – you will reap the benefits of high-quality air-conditioning year after year. It’ll save you money as your AC unit doesn’t have to work so hard to keep your room cool. First, remember to turn off and unplug your air conditioner. To access the filter, you first need to open up your air conditioner unit. You can do this by either simply pushing and pulling down the removable front grille panel, or by unscrewing using a screwdriver. Once you have removed the grille, you’ll be able to reach inside and retrieve the filter. Depending on the size of the filter, there are a few different ways to remove any dust and grime that may have built up. If it is a small unit, you’ll be able to leave your filter in a sink. Soak it for 10 minutes or so in warm water with a little detergent. Recommended Article: Intrigued by portable AC units? Don’t miss our guide to the quietest models on the market. If your filter is too large for the sink, you can move it to an open space – perhaps your front yard, or clear a space on the floor by laying down a protective sheet. It’s easy to make an AC filter-cleaning solution from products you have lying around at home. If your filter has a layer of dust and general dirt, this can be removed with a cloth or brush and a solution of warm water with detergent. If there is mold on your filter, which can happen – especially with window air conditioners – you can mix a small amount of household bleach into your solution. Bleach is highly effective at removing and killing mold, preventing it from growing back in the future. Apply this solution using a cloth, sponge or soft brush and gently remove any dirt, debris, and mold from all corners of your filter. Rinse the filter thoroughly – either under the faucet or with your garden hose and leave to dry completely. 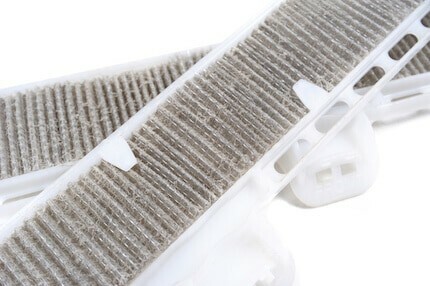 While the filter is drying, you can use the time to clean out the inside of the air conditioner itself. Dust and sediment can collect inside the interior of your unit too and can be removed with a vacuum cleaner and a gentle wipe with a damp cloth. Once both the unit and your filter are completely dry, it’s time to replace the filter and the grille and plug the unit back into the power supply. Now you can enjoy an effective and efficient air con system that delivers fresh, cool air during those hot days when you need it the most. Recommended Article: We cover the top window air conditioners in this article. 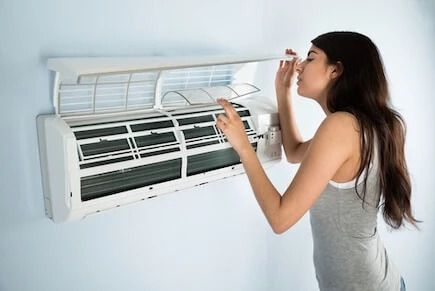 Not only is this great for your quality of life and respiratory health, but it also prolongs the lifespan of your AC unit, saving you time and money on repairs and replacement. Making sure you have an effective air con system is not only good for your wallet, but it is also an environmentally-responsible decision. If you’ve got a dirty, clogged filter, your AC unit will be less efficient and you’ll need to use more energy to produce the same amount of cold air as a clean filter would. Make the most of the fantastic tool that is air conditioning and enjoy cool, fresh air when you need it the most by cleaning the filter regularly using the tips above. There is nothing worse than coming home to a sweltering home, turning on the air con for a blast of cool air and getting nothing from your unit! Simple maintenance will help you – and your home – keep your cool! Check us out on Facebook to see more useful articles like this one!